Late 1920’s Standard “Towerlyn” Pedestal sink. This sink is spectacular! The only non-original parts on this sink are the escutcheons. The original metal ones were gone when we got it, we went through our 1926 “Standard” catalog, found a line drawing of the original escutcheons, and duplicated them as close as we could. 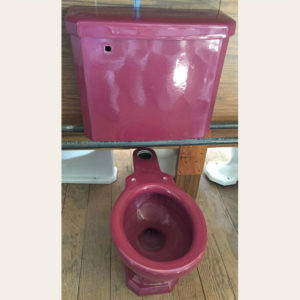 The color is “T’ang Red”, and was only found in high end homes. We do have a matching toilet. The sink does have several chips on it, none are bigger than a grain of sand, and all have been sealed with a clear epoxy to help them blend back into the red color. This sink stands 30″ tall, is 24″ wide, and extends out from the wall 19 3/4″. This sink is too large for UPS, it has to go truck freight. 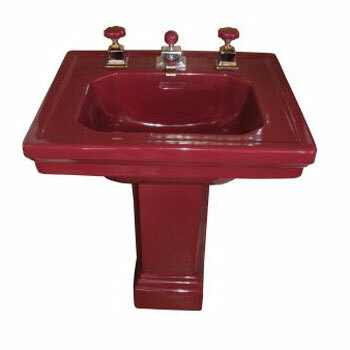 This is only the second Towerlyn sink we’ve had in 37 years of business, grab it quick!